The jewel DISMAL was created back in June 1995, nearby Turin, when Bradac and Parsifal joined artistically in symbiosis with Earth’s soul. Since the beginning, Dismal chanted about their ‘Alma’ and its trascendental wanderings, turning into a visionary syntesis of their own sublimation, while their works express particular alchemic dimensions comparable to the metamorphic stages of a butterfly. The hypnotic images created by the two artists during the years describe the visions of a mind drunken by paradox, on its path to the inevitable implosion and the consequent conversion of an inner pale sun. The first period is dedicated to the experience and the artistic maturation, through the recording of some demotapes. Finally in november 1998 Pagan Moon Records releases the debut CD “Fiaba Lacrimevole_like a red bleeding rose in a glacial desert”, which also introduces the new female singer Margan. The album is a fairy drama divided in three acts, based on symbolism and metaphors referred to the introspective experience. The theatrical part is now more intense than before and the musician becomes actor in an oneiric context, soaked with an enchanted realism and glacial apparitions. In 2001 the new singer Ae replaces Margan. 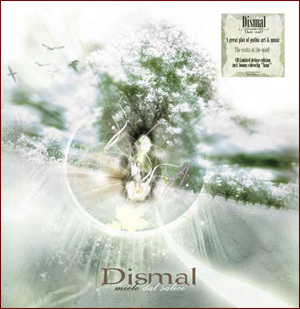 With this new line-up Dismal released the new petal “Dionisiaca”, which was licensed by Beyond…Prod. With positive responses coming from many European nations: (Rock Hard 8/10, GRIND ZONE 5/5, Vinil mag. 9.5/10, Metal Shock 9/10, RUMORE: Fascinating in its visionary and archaic Gothic perspective. Actually curious and stimulating… Elegy mag: Un mot: SUPERBE! D-SIDE : Un genre à part, peu pratiquè mais tellment novateur. Un agreàble surprise. …qui vous lasse sogneur quand le disque s’achève. Ecc..) In September 2002 DISMAL sign a new deal with DreamCell 11 Entertainment /Aural Music and in October of the same year they enter the Gulp! Studios to record the long-awaited album “Rubino Liquido -Three Scarlet Drops…“ with the support of a real orchestra of 12 elements and Marco Calliari (known for his work with the italian chart-smasher pop band Subsonica) as the producer. The album got an amazing response from media and fans all over the world, and lead to a second album with Dreamcell11/aural music: MIELE DAL SALICE. The year 2006 has been completely dedicated to the conception and creation of this new album, a massive step up in terms of research and sound.